I have a tendency to accumulate preps that I like, for example flashlights, knifes and back packs. Now I have too many of all three, but it seems like I am always getting more. The ones I am not using go into storage or I give to my grandchildren to use. 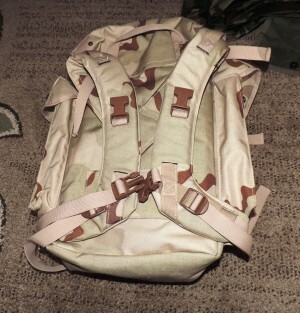 The other day I got a nice little grab and go bag that is genuine Dutch Army Surplus, that I intent to use for myself. My friend FreezeDryGuy gave it to me. He has a bunch of them and they are brand new. They are perfect for get home bags, bug out bags smaller individuals and children or just a grab and go bag for your everyday carry. When he first told me, he was sending one to me, my first thought was Dutch Army, it won’t be anything special. But I was wrong; it is a very nice pack. It is made of what appears to be a heavy-duty Cordova nylon and if anything, it is over built. The pack measures approximately 16″ x 12″ x 8″. Here you can see the interior of the pack. Notice that there is an Apple laptop in front of the foam pad and on the lower left there is a poncho liner. interior is divided into 3 compartments, with a removable pad to protect your back. I was able to slide an Apple laptop into this pouch and it is protected by the pad. It has two nice side pockets. The side pockets are well designed and have two tough press-studs for closure. There is a slip pocket behind the side pockets that will carry a hatchet or small shovel. The interior of the bag is divided into three sections. I have been playing with the pack while I decide exactly what to carry in it. 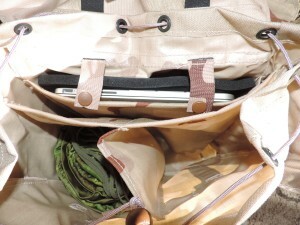 I have been able to load a good four day’s supply of food into the two side pockets. In the interior, I have loaded a poncho and poncho liner, they took most of one of the three compartments. I intent to add a fire starting kit, Sawyer mini water filter, a hank of 550 cord and a small first aid kit. This will leave me plenty of room for clothing, a knife and flashlight. Here you can see one of the side pockets. Notice the nice well padded shoulder straps. The pack has nice well-padded shoulder straps and is quite comfortable to carry. The only thing I might change would be to add a waist belt. There is a handle at the top of the bag for easy carrying. 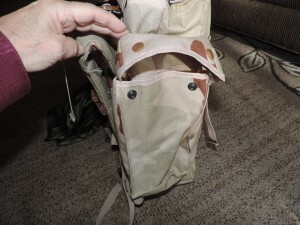 The bag has webbing stitched onto the lid and main compartment to attach more gear if needed. 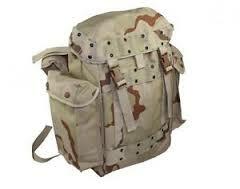 The pack is available from FreezeDryGuy for $69.95 and this includes free shipping. This is a nice grab and go bag that I have no hesitation recommending. This entry was posted in Seventy-two hour kits and tagged grab and go bag. Bookmark the permalink. Thanks for sharing your little Dutch army bag and its features. This little bag looks like it would be perfect as an emergency pack! In fact, I should probably try getting some other army surplus supplies so that I can fill these up with useful things. The divided interior is also really nice for organizing your things quickly.